Whether you're frosting a cake or making some truffles, give your cooking a flavor filled boost by making peanut butter ganache instead of the standard chocolate. The nutty, rich flavor of peanut butter together with sweetness of chocolate for a ganache is the perfect complement to many desserts. Ganache is one of the simplest desserts to make, while chocolate and peanut butter is one of the most classic dessert combinations. This recipe begins with the standard chocolate and cream ratios and adds peanut butter and vanilla for additional flavor. The finished ganache can be turned into any number of decadent desserts. Place the chopped chocolate and peanut butter in a bowl and set aside. Heat the cream and vanilla on the stove and bring to a simmer for 3 minutes. Pour the hot cream on top of the chocolate and peanut butter. The heat from the cream mixture will help melt the chocolate in a few minutes. Stir well to combine until smooth. The quality of your chocolate will have a big impact on the flavor of your ganache. Use the best quality gourmet or artisan chocolate you can find for the best flavor. While natural peanut butters are more flavorful, their gritty texture will interfere with the formation of the ganache. To avoid this, use the smoothest textured peanut butter you can find. 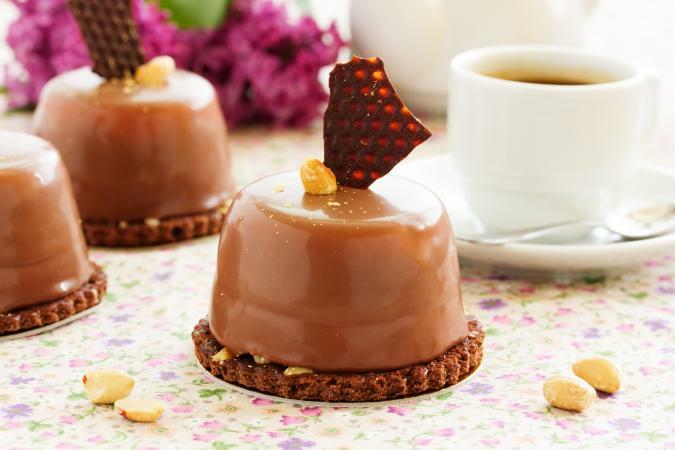 The freshly mixed ganache can be used in a number of ways. Make a tart from the hot ganache by pouring it immediately into a pastry shell and allowing it to set up inside. Use it as a glaze for a chocolate cake; allow it to cool just slightly on the counter and pour or ladle it over the finished cake. The ganache will continue to harden as it cools on the cake, leaving a thin, shiny coat of frosting. Make the ganache into spreadable frosting; place it in the refrigerator for up to an hour until it becomes firm enough to spread. Do not leave it too long or it will harden too much to be easily worked. Make peanut butter flavored truffles; allow the ganache to harden overnight, covered, in the refrigerator. Scoop the hardened ganache into balls using a melon baller to form the center of the truffles. Dip the peanut butter truffles in tempered chocolate or roll them in cocoa powder or gourmet sprinkles for a chocolate peanut butter candy. Ganache is such a simple base that it can easily handle any number of additional flavors. Try adding hazelnut spread, flavor-infused cream, or a mixture of chocolates to make this recipe your own. No matter how you prepare it, peanut butter ganache is sure to become a favorite at first bite.